I threw my Vibram 420 tester hard and flat, directly into a 25-30 mph headwind and it never hinted at turning over. It flew straight for about 200 feet and then began a fade for about 30 feet, until it just started diving down to the ground. I was playing hole 6 at Pye Brook, for those of you familiar with Massachusetts courses; it’s a righty friendly hole where you’re throwing along the edge of a hill and the basket is at the bottom tucked in behind some trees. With no wind, a strong backhand with an overstable midrange will get you to the pin. I actually prefer throwing a Leopard on a big hyzer angle because the glide lets me throw real soft and there’s less to mess up. On this very windy day, I figured that since I normally throw a Leopard I’d better disc up to something way more stable. Teebird? Not stable enough for this headwind. So my first attempt was with a Banshee. I threw it on the same angle that I normally throw my Leopard- dipping the wing about 20 degrees. The Banshee immediately fought back up to straight and started turning over. 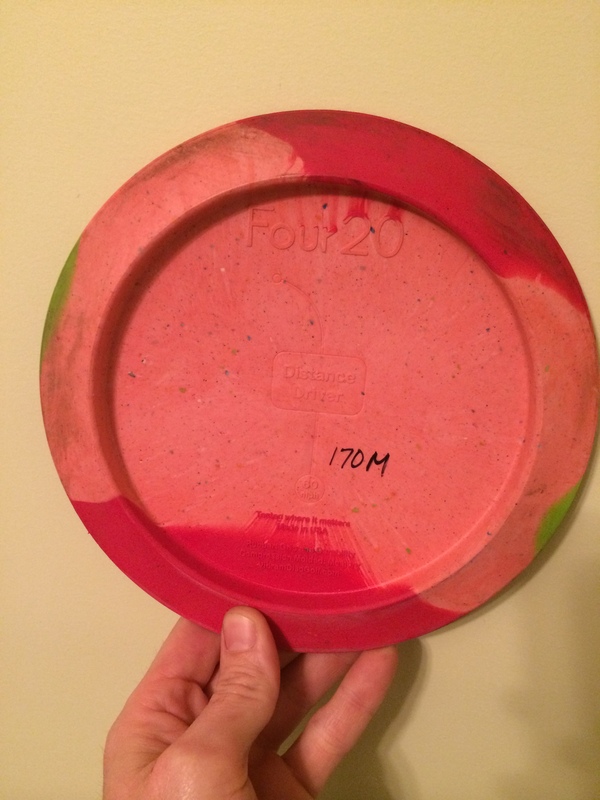 It tried to fade back over, but the wind kept it afloat and the disc flew straight for the entire flight- and landed dead straight about 290 feet away when it was supposed to fade down the hill about 90 feet to the left. That was when I tried the 420. Like I said, it flew straight and then faded left for me just like I wanted. It’s worth reiterating that the wind was fierce. It was the kind of wind that knocks over trash barrels and blows the hat off your head. My tester disc is in the Medium blend of Vibram rubber. I personally don’t like distance drivers with this much flex. It feels weird when I squeeze my grip really hard (the whole thing bends) and it wobbles a little when I flick it forehand. Speaking of forehands, apart from the softer Medium rubber, I do think this will be a good disc for forehand players. I can flick with either a lot of snap, or a lot of arm. The snap style flick will produce a lot of spin and get the disc to glide really well, whereas the arm style will induce an S curve and get a bit more distance (but also be more susceptible to the effects of wind). On both of these styles, the 420 remained overstable. There are some discs out there that are so overstable, and so fast, that you can throw them like a football (almost overhand, on a 45 degree angle) and they will still fight back out of it- for example the Prodigy D1 can be this overstable. Or the Nuke OS or Innova Ape. The Vibram 420 is not in this category of “ridiculous meathook” discs. The 420 has a limit where it’s speed and stability can be maxed out, but I personally don’t believe any mortal player who doesn’t throw over 500 feet can find that limit throwing backhand. 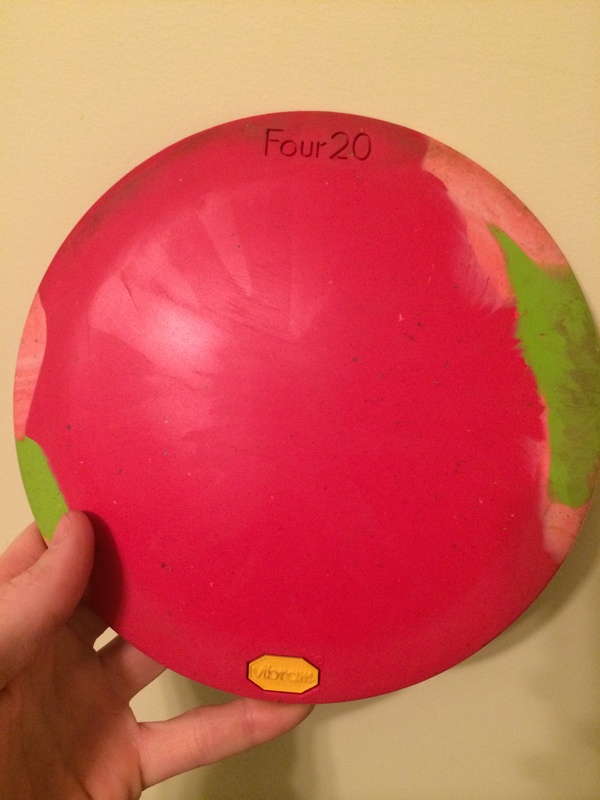 I would categorize the 420 as a disc faster than the Firebird. I’ve always liked the utility of the Firebird, but at the same time with my arm not being super strong I find I can get the same distance with a Drone. With this in mind, I enjoyed how the 420 had the overstability of a Firebird (maybe not quite as much overstability) but was much faster and therefore covered more distance before it faded out to the ground. The basic feel of the disc is that of a distance driver- the rim is a full size much larger than the Trak or Ascent. Yet the depth of the rim isn’t too much for smaller hands; I’d categorize it as average depth. The underside of the wing just has an inward curve, which I assume is what helps give it the overstability. 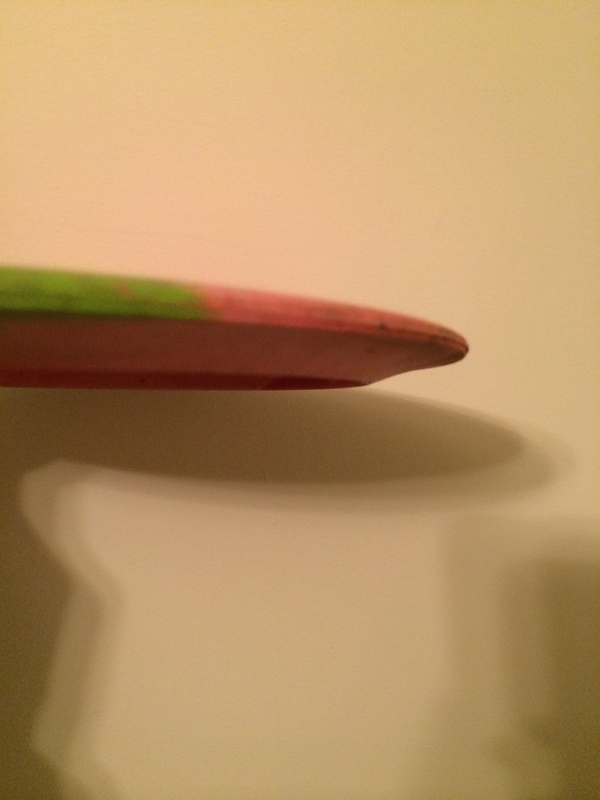 My general feeling with the Vibram 420 is that it is a legit wind fighting disc, and it will prove valuable for forehand players. I personally will not be putting one in my bag until after I can try out a firm one. The idea of the disc, and the performance of the mold so far is definitely appealing, so I genuinely will consider putting one in my bag. My only complaints are unrelated to the mold: I don’t like the way Vibram’s discs are all mixed up blends of colors- they’re difficult to find in the woods (under piles of leaves etc…). And I also don’t care for the Medium rubber- while they say it has unsurpassed grip, I find it to be slippery on my fingertips. This entry was posted in Equipment and Gear and tagged 420, disc, equipment, golf, headwind, over, overstable, review, stable, vibram, wind. Bookmark the permalink.